From an article by Scott Mainwaring in The Vexilloid Tabloid #48, October 2014. 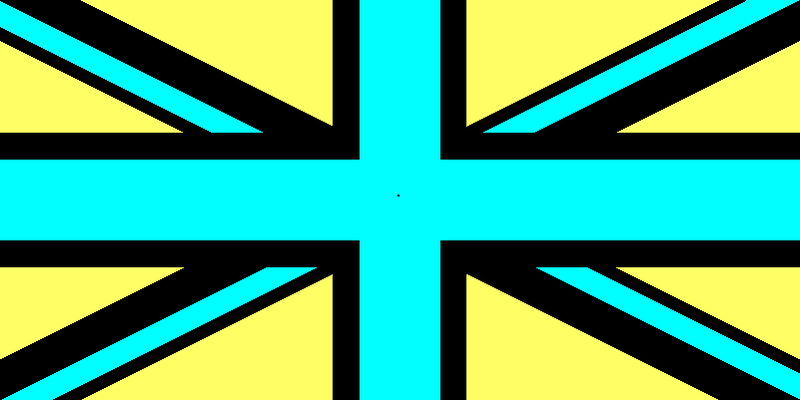 Color is so elemental in flag design that colors is a synonym for flag. 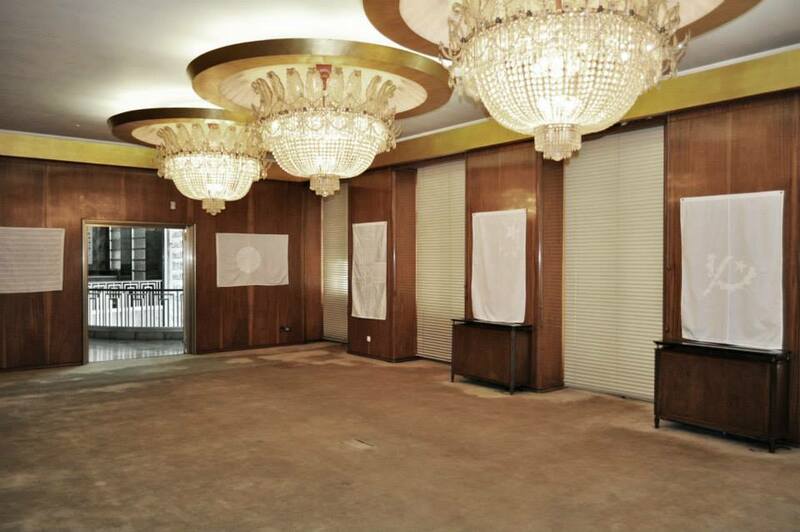 Recently, however, all-white flags have been in the news due to two Berlin artists, Matthias Wermke and Mischa Leinkauf. 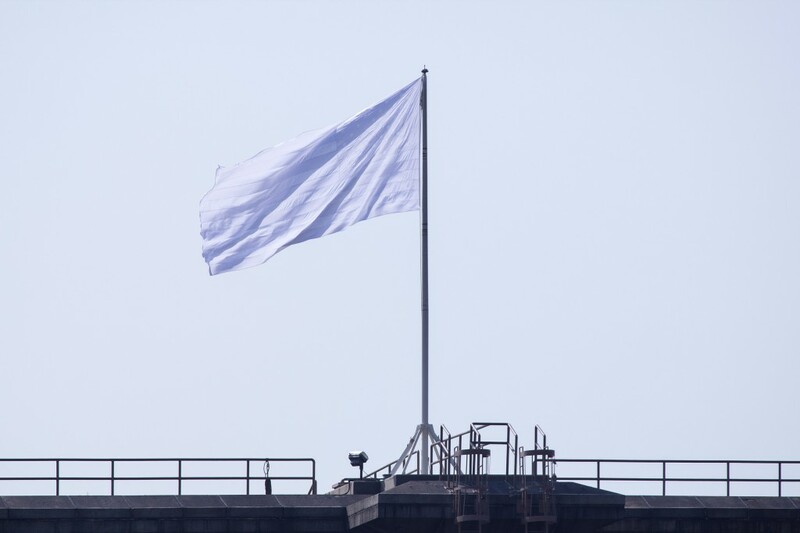 In the wee hours of July 22 they evaded police surveillance to replace each 10-by-19-foot U.S. flag atop both towers of the Brooklyn Bridge with all-white versions of their own making. 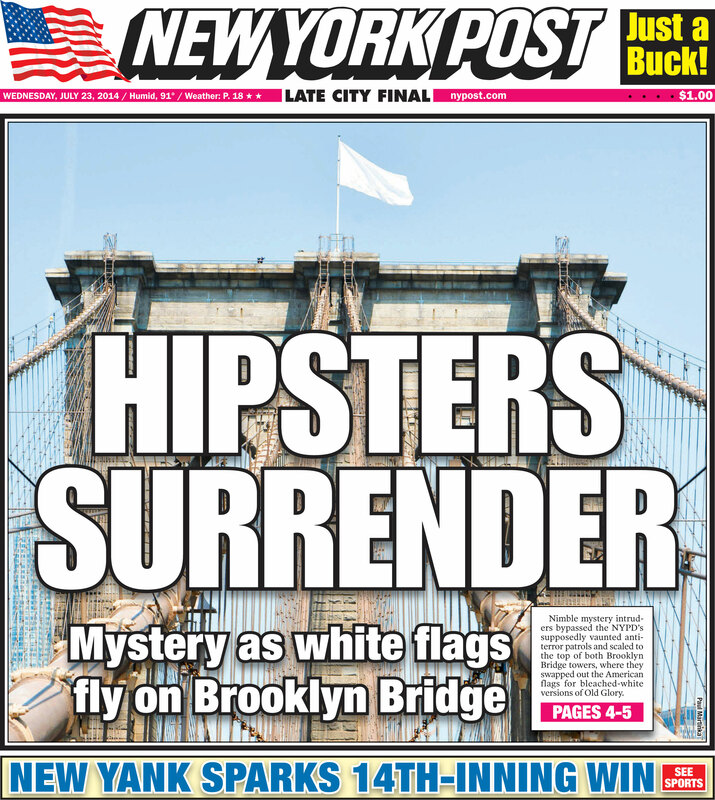 New Yorkers awoke to this strange spectacle, and quickly began joking about surrender. New York Post, 23 July 2014. Brooklyn Bridge, 22 July 2014. Photo from ilovegraffiti.de. 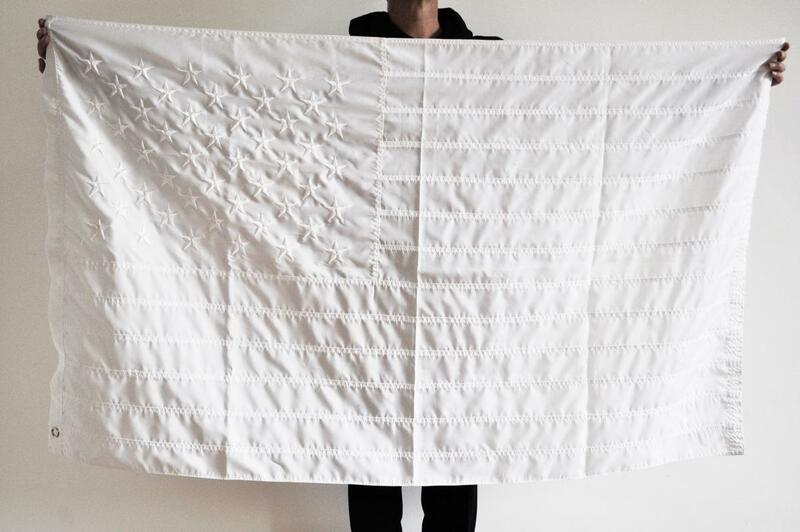 Wermke and Leinkauf are not the only artists to produce all-white American flags. I’ve come across at least three precedents. 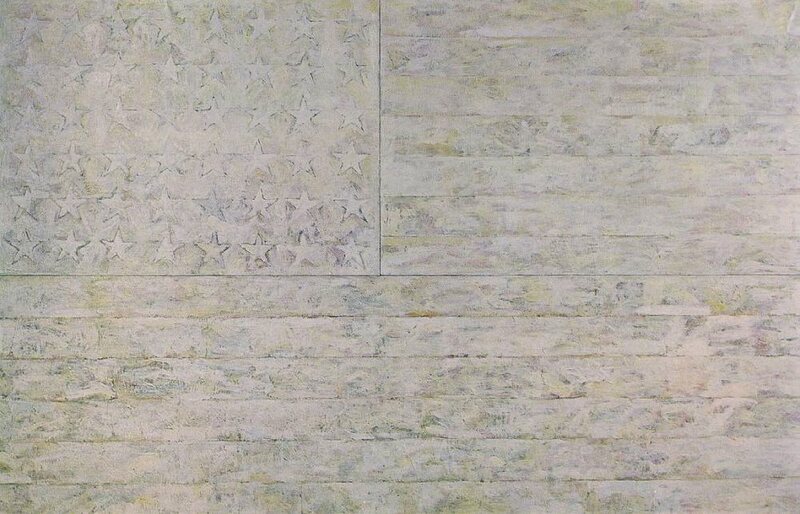 Earliest is Jasper Johns’ monumental 1955 painting White Flag, now in the permanent collection at New York’s Metropolitan Museum of Art. 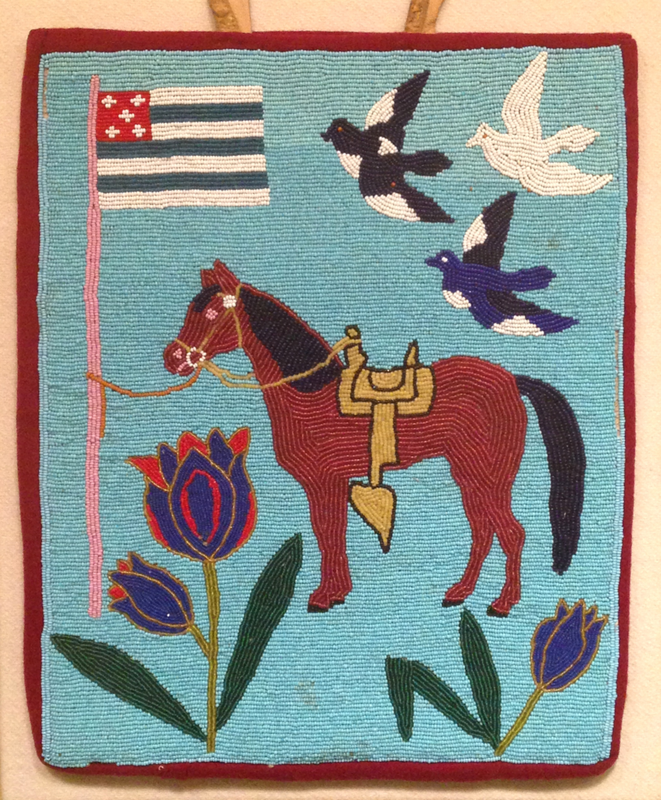 Another is the flag James Cross painted white, photographed, and submitted to a 1986 design exercise by Kit Hinrichs. 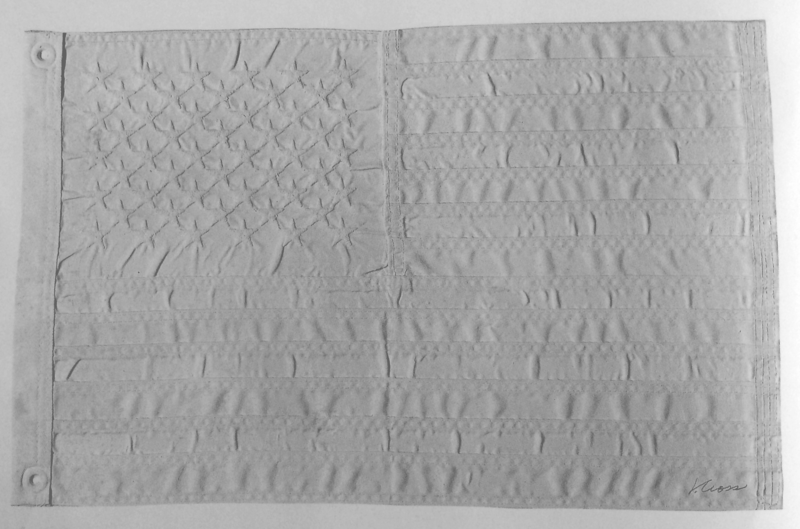 Third, like Wermke and Leinkauf and at roughly the same time, Portuguese artist João Felino fabricated and displayed an all-white U.S. flag as one of many “de-colored” national flags in his “Flags of the World” project. Jasper Johns: White Flag (1955). From jasper-johns.org. Jasper Johns’ painting is a major milestone in the history of modern art, a force to be reckoned with by any subsequent artist working on this theme. It’s large (10 by 6 feet), richly layered (made of wax, pigment, and newspaper clippings), and deeply ambiguous. As critic Andrew Graham-Dixon points out, it was originally understood as “art for art’s sake” having little to say about the flag and its meaning, instead “[forcing] the viewer to contemplate only the act of painting itself”. Johns then divulged, mysteriously, that it had come to him in a dream, rooted in a trip he took with his father to a monument to their ancestor William Jasper, who died in the American Revolution saving a flag from enemy hands. And how could it not be seen as a commentary by the young, gay, and left-wing Johns on 1950s America in which ideals of free speech and free association were buried under layers of homophobia and McCarthyism? In White Flag, Johns laid the foundation of a life-long project in which he painted and repainted the American flag many dozens of times and ways, continually returning to it and questioning it. James Cross: untitled, 1986. From Kit Hinrichs: Stars & Stripes, Chronicle Books, p.24. For his 1986 book Stars and Stripes, Kit Hinrichs invited fellow graphic designers and illustrators to reinterpret Old Glory to make a related point: that the U.S. flag itself invites reinterpretation, and that those obsessed with “protecting” it from “misuse” are misguided. James Cross’s flag covered by thick white paint is, like all the other submissions, an expression of the American ideal of liberty, to make and remake our own meanings independent of formal codes and standards. The book presents all the re-workings without commentary, leaving them to the reader to interpret. Closeup of one of Wermke & Leinkauf’s enormous white flags. From ilovegraffiti.de. We investigate the boundaries of public space in urban environment through different kinds of interventions and performances. We temporarily override limitations and constraints without permission or invitation. Our aim is to question common standards and to show the beauty beyond these standards. 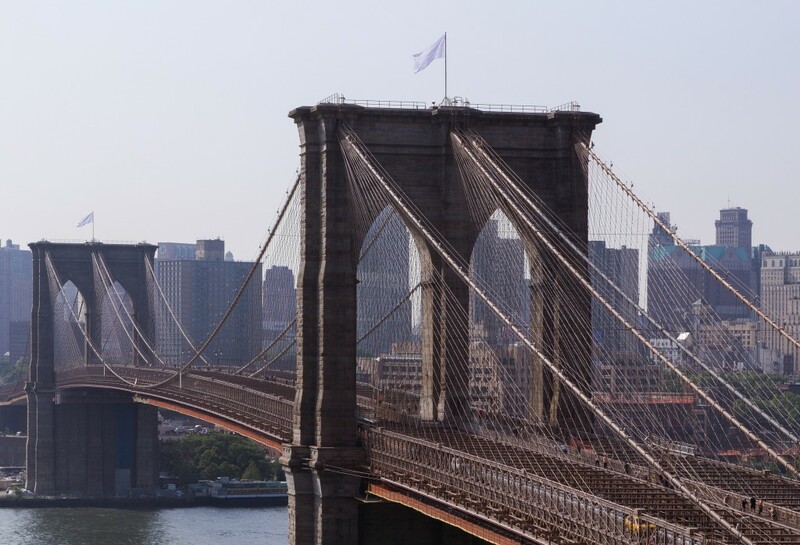 This particular stunt was a tribute to fellow German John Roebling, who designed the Brooklyn Bridge and died during its construction, and his American-born son Washington Roebling who oversaw its completion—and to the bridge itself as a wonderful accomplishment and public space. 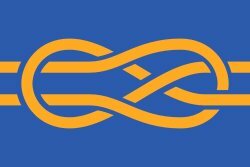 Their intervention calls attention to the two huge flags that are part of the bridge’s design, and (unlike the other three cases) to the power of flying a flag in a public place. João Felino’s de-colored flags as exhibited in Lisbon, May-August 2014. Felino holding his de-colored US flag. This nicely expresses the idea that there is a “language of flags” that unites all nations in common needs of self-expression, respect, and autonomy, but also in the material requirements of flag design itself. Flags are about free speech and liberty, but also standards and constraints. The questions that Jasper Johns first raised in White Flag in 1955 continue to resonate. How can flags be at once commonplace but extraordinary, standardized but reinterpretable, divisive but universal, and admitting so many layers of interpretation and meaning? The “simple”—but provocative—act of draining color from a flag is a surprisingly rich way to explore fundamental vexillological concerns. 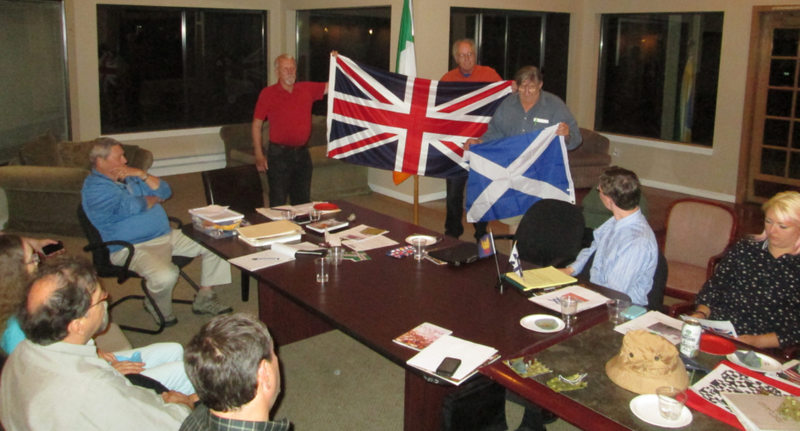 You’ll also find a “What’s that Flag?” quiz from David Ferriday, Ted Kaye’s notes from the very well attended September PFA meeting, and other items of vexillological interest. 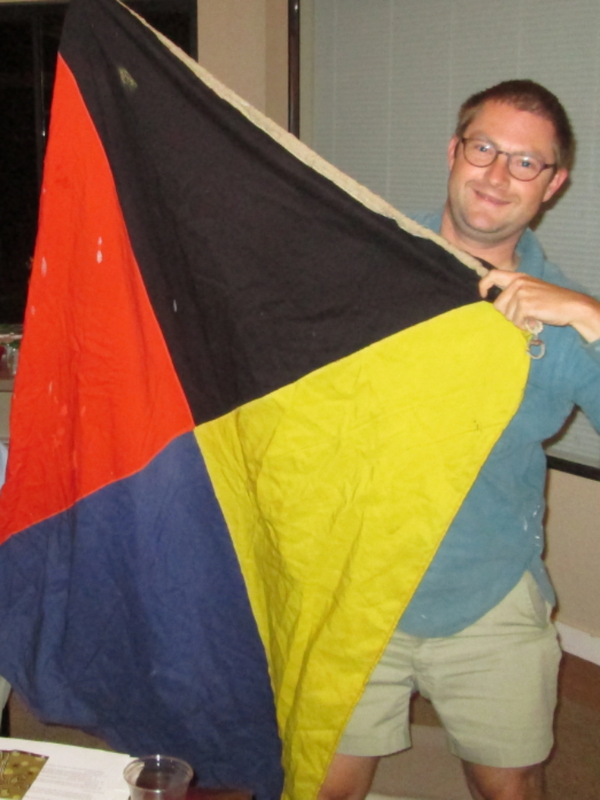 “Zulu” says Carl Larson, showing one of many maritime flags he’s acquired. The Alaska flag in Michael Orelove’s “flower bed”. 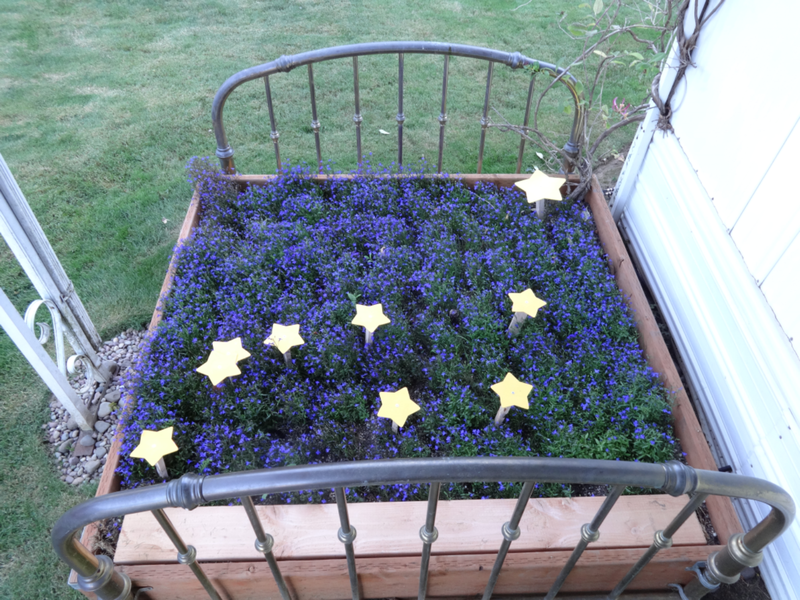 The blue flowers are lobelia, (“Crystal Palace”); the second star is correctly depicted as a multiple-star system. 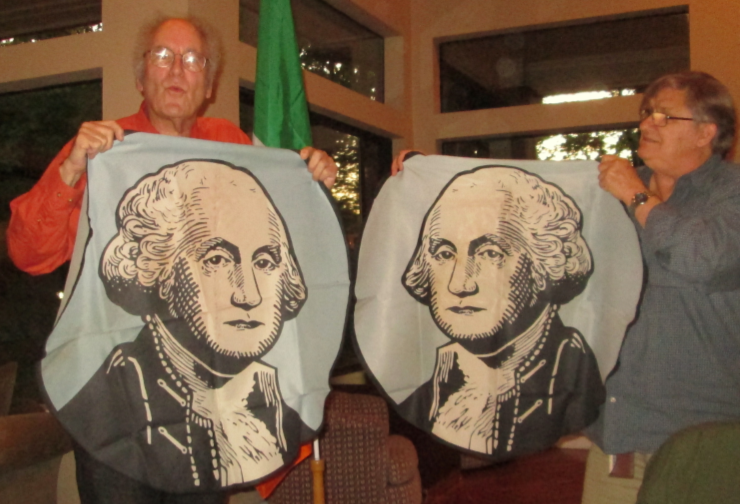 By deconstructing an actual flag, Michael Orelove (L) demonstrates that Washington’s obverse is actually the mirror image of its reverse (so George always faces the hoist). 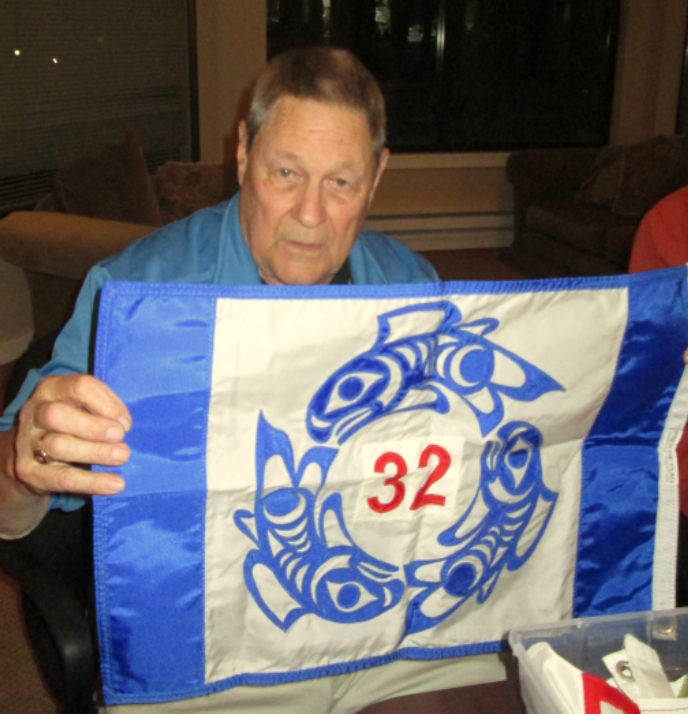 Larry Snyder designed the flag for U.S. Power Squadron District 32. 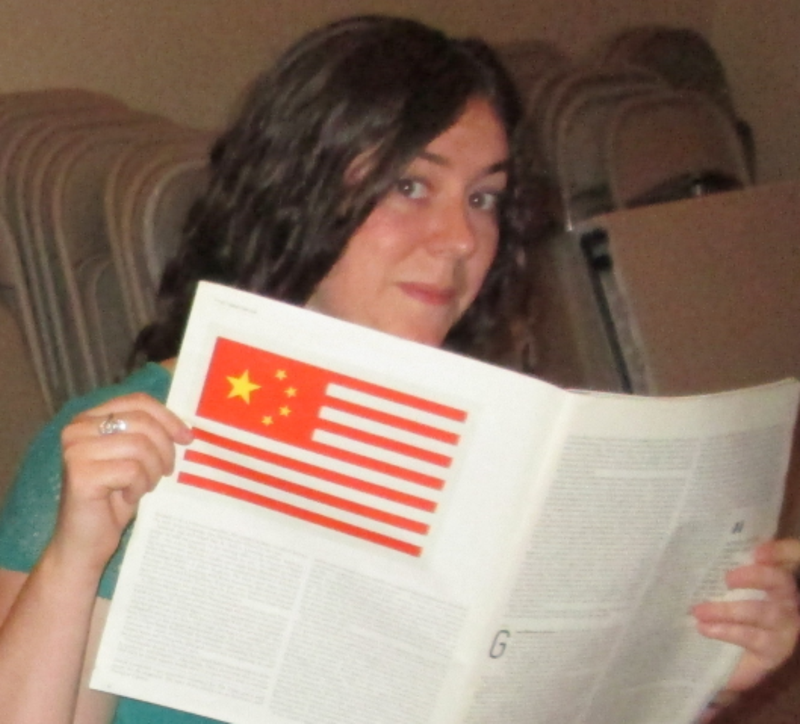 Lindsey Matson delves into the world of alternate history flags. In the evening’s most popular topic, Patrick Genna explains the history of the Union Flag and explores the vexillographic implications of Scottish independence. 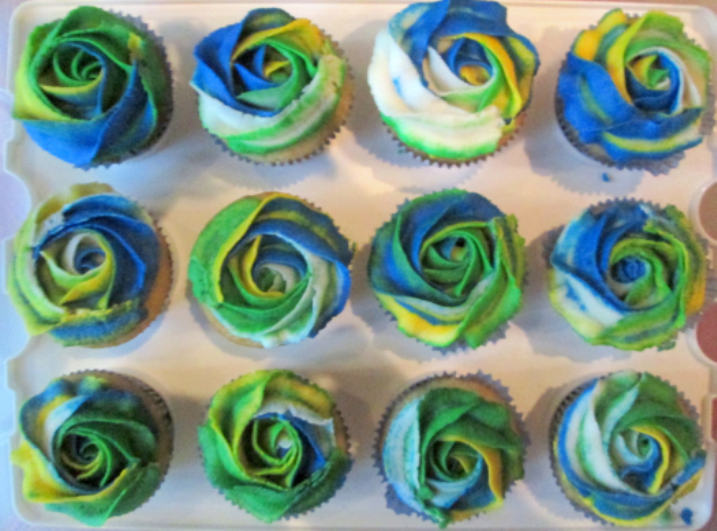 Cupcakes in the PFA / Portland flag colors, courtesy of Keryn Anchel. David Ferriday (L) and Carl Larson (R) with historic US flags poster. 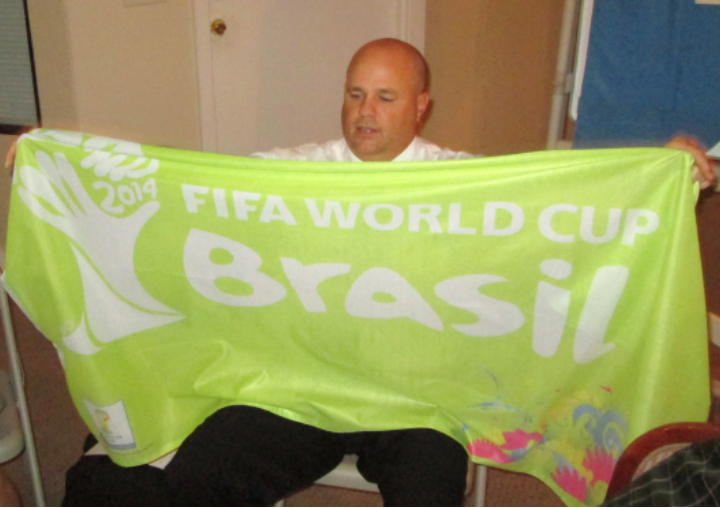 John Niggley recalls the recent 2014 FIFA World Cup with a licensed flag. 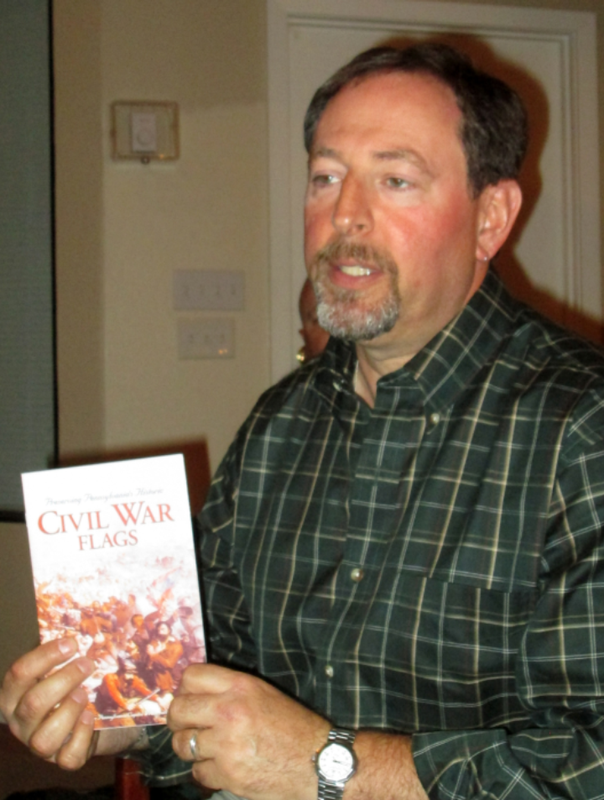 A Pennsylvania native, Dave Anchel describes the flags of the Civil War held in its capitol’s collection. FLAT BAG, c. 1885 Glass beads on hide with cotton lining. The Elizabeth Cole Butler Collection, 2012.25.72. 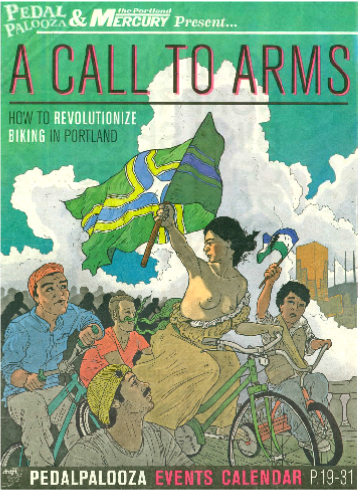 The Portland Pedalpalooza Bike Festival uses the flag of Portland (along with Cascadia’s) to promote an eclectic mix of over 260 events.